It is interesting to note that not only Hindus, but Muslims and Christians also learn and perform Kalaripayettu as well as some of the dances mentioned above. 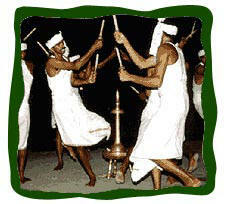 For instance, the Kolkali dance is performed by both Hindus and Muslims. It is a vigorous dance in which dancers wield two feet long sticks and move in circular formation attacking and defending with the sticks. While dancing they sing particular songs in a lusty folk style. The songs are called Bhadarmuni Pattukal, ie. Sword fighting Songs. Generally, middle aged men, who have perfected the techniques participate in the dance. The group consists of twelve to twenty dancers. Small cymbals and smaller kind of Chenda, the drum provide the percussion music for the dance.